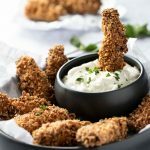 Crispy, crunchy, savory fried chicken bites with a scrumptious sauce for dunking. Perfect for family dinner. Also makes a great party appetizer, meze or game day treat. 1 ¾ pounds boneless skinless chicken thighs or breasts, cut across the grain, in 1-inch intervals, which should give you approx. 1-inch by 3 inch strips. 1½ to 2 cups of neutral high smoke point oil such as peanut, canola, grape seed or sunflower seed oil, or enough oil to come up to about an inch in your skillet. If baking the chicken, you’ll only need a tablespoon or so of oil. MAKE THE TAHINI YOGURT REMOULADE: Mix all the ingredients together and store, covered, in the fridge until ready to use. Can be made a day ahead. MARINATE THE CHICKEN: Mix the marinade ingredients in a large non-reactive bowl or plastic container. Add the sliced chicken and toss to coat. Marinate chicken for at least an hour and up to 24 hours, covered, in the fridge. I highly recommend an overnight soak for maximum tenderness. COAT THE CHICKEN WITH SESAME PANKO CRUMBS: In a large shallow bowl combine Panko, sesame seeds and salt. Remove chicken from the fridge and drain the marinade. I recommend pouring the chicken and marinade into a large colander over the sink. Toss chicken around with a large spoon to get the marinade off. It’s fine to leave a light coating of marinade on the chicken. Transfer chicken to a bowl. Place a piece of chicken in the crumb bowl. Toss it in crumbs a few times and press crumbs into it with your fingers. Place coated chicken piece on a plate. Repeat with all the chicken pieces. FOR OVEN-BAKING: Preheat oven to 450ºF. Oil a large non-stick rimmed baking sheet. Arrange breaded chicken on the sheet so pieces aren’t touching. Turn pieces so they are lightly coated in oil. Alternatively you can spray the tops lightly with cooking oil. Set rack in the top third of your oven, near the heating element. Bake for 12-14 minutes or until the chicken is golden brown and cooked through. FOR PAN-FRYING: Line a large plate or tray with a triple layer of paper towels. Pour enough oil into your skillet to come up to an inch or more. Heat oil over high heat until hot but not smoking. Cook the chicken in batches so as not to overcrowd the skillet. Carefully place the chicken pieces into the hot oil one by one using tongs. Chicken should start to sizzle immediately. Cook chicken pieces for about 2 minutes or until they are rich golden brown and cooked through, turning each piece after a minute or so for even browning. Transfer chicken to prepared plate and repeat with remaining chicken pieces until all are cooked. Set chicken on a platter with remoulade on the side. Sprinkle chicken and remoulade with dry or fresh mint, if you like. Chicken is most delicious if you serve it immediately. Store leftover chicken in a airtight container in the fridge. Reheat on a baking sheet in a 450ºF oven for 4-5 minutes, until heated through.